Release Notes:30.0 and 29.0 branches. Unless otherwise noted, the wiki documentation refers to the latest stable release version. Check the Manual of Style for more information. Welcome to the information and documentation wiki for MythTV! 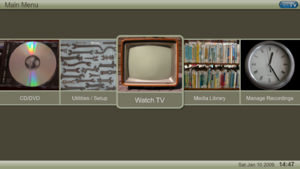 We're here to provide collaborative documentation of the MythTV project, an open source software Media Center capable of recording TV (similar to Tivo), playing videos, DVD Discs, Bluray Discs and music, viewing photos and much more. Register yourself and contribute. Anyone with an account and a confirmed email address can edit our pages. ...and don't forget all the navigation links in the sidebar to the left. This page was last modified on 11 February 2019, at 12:03.